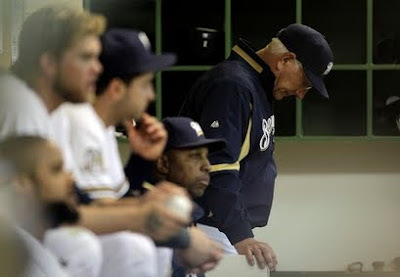 There is a problem with the Milwaukee Brewers through the first two months of the season. Call it inconsistency, call it velocity, call it whatever you like. The fact of the matter is, something needs to change and soon if this team wants to consider itself a playoff contender. Some want to blame General Manager Doug Melvin for the current sub-par performance of the team, the only problem with placing the blame on him is that he has done the best with the resources available to him. Is it his fault that the pitchers he's signed aren't living up to their numbers? No. Is it his fault that not one but two Center Fielders have been hurt, leaving Jody Gerut as a very unfortunate starting option? No. Is it Doug Melvin's fault that Prince Fielder hasn't repeated his success of a year ago, when he set a club record for RBI's in a season? No. It's not Melvin's fault, but it's not Ken Macha's fault either. That said, Macha still needs to go. 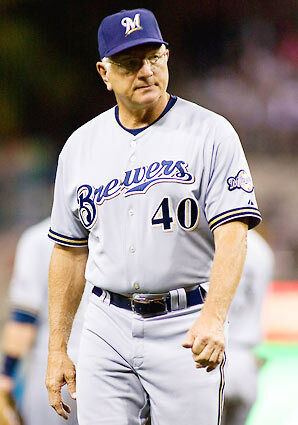 The Brewers are not living up to the talent level of their team. Doug Davis' ERA is three runs higher than his career average and Randy Wolf's is a run higher, that says players aren't producing. When a team has talent but isn't producing you change managers. Melvin won't be overhauling the roster in season so if he truly believes in the players he has assembled he needs to give them a chance with a manager that they appreciate and respect. Give them someone they want to play for. Ken Macha is not the Manager for this team. It shouldn't matter, opponents will say. And that's true - some groups of players that maybe aren't as tight knit or with different personalities might thrive under a Manager as stoic and passive as Ken Macha, but they might not also. As fans we don't like Macha for his seeming indifference to what goes on in the game. He sits in the dugout like a tired old man with a passing interest in what goes on in front of him and doesn't seem to have any impact on the field of play. You can pick apart his lineup choices and bullpen use and can find valid mistakes that he has made but his attitude is what bothers people the most. So what will happen? What will the front office do with Macha? If the team finds some mojo or just plays to their ability they can make their way back into the wildcard in what looks like a mediocre National League chase. If they do manage to remain in contention for that fourth playoff spot then Melvin has no choice but to stick with Macha through the duration of the season. The question is, does a slim chance at the playoffs make it worthwhile to stick with a team loaded with average veterans? If your answer is yes than you have to stick with Macha. This team, as assembled, is Ken Macha's team. But if things continue to fall the way they have that needs to change. Parts need to be moved and replacements found. The Brewers would need to go young and young means so long Ken Macha. If you watched Mat Gamel's time with the big club a year ago the last thing you want to see is Macha handle any of the team's brightest young stars. Does selling off some replaceable parts mean giving up on the season? Start with the Manager now, if you keep losing move some players that are likely on their way out anyways. Gregg Zaun won't be back next year, not with the emergence of George Kottaras and the continued strong play of Jonathan Lucroy in the minors. Other names that could draw interest to contending teams would be Corey Hart and Jim Edmonds. Edmonds certainly won't want to play out his Indian Summer for a team slowly falling out of contention. Hart is the interesting one, as a player who should be - ideally - in his prime he could actually bring back a couple of prospects that can help the team. I've danced around some ideas but what it comes down to is this: firing Ken Macha won't make this team worse. Promoting Willie Randolph or Dale Sveum may not necessarily make this team better but it won't make them any worse than they currently are. At the very least you will be sending a message to your fan base that mediocrity won't cut it.